The vendor file contains every vendor you’ll ever do business with, including account number, name, address, and some account information. Anyone who bills you with an invoice would be a vendor, especially freelancers. Vendors are paid with checks written in the Checkbook against their unpaid invoices. The vendor code tracks purchases and invoices for the things you buy. The vendor account keeps a running account balance, so it’s easy to see at-a-glance just how much you owe someone. When an invoice is added into Accounts Payable, you’ll enter the vendor number first -- this links the invoice to the vendor account on reports, especially the account agings. Deciding who is a vendor is simple: If someone invoices you for things or services you buy, they’re a vendor. You can’t add a payable invoice unless the vendor exists (although you can add a vendor at the same time as the invoice). Once a vendor is added, it can be used again by entering in the vendor number. Detailed account information can be easily maintained for each vendor, including task, markup, and notes. This information stays in a central location (your Clients & Profits database) and is generally accessible to everyone. This makes finding vendor information much faster than using someone’s Rolodex cards or filing system. This information can be entered, changed, or deleted, any time. A vendor with a balance or any activity (including paid invoices) can’t be deleted. Otherwise, its invoices wouldn’t have a vendor account balance to update on aging reports. One of the ways in which markups are managed is through the vendor account. Every vendor can have a special markup percentage. This percentage is copied automatically to every invoice you’ll add for the vendor. It’s a useful way to precisely control your markups, for more consistency and accuracy. Here’s how it works: When a vendor is first added, it gets a markup from Agency Information. This is the standard agency markup. When an invoice is added for this vendor, its markup is copied to the invoice. If a job task has a guaranteed markup (which you would have set up on the client account or task table, per some arrangement), it replaces the vendor’s markup. Of course, you can still change the invoice’s markup without affecting the job or the vendor account. This ability lets you program basic markups for different vendors. Some vendors, like printers, might always have the standard 17.65% markup (which calculates to a 15% commission on the cost). Other vendors, like typesetters, might have a 50% markup since their invoices are smaller. Or, a large vendor (like a media firm) might have a 12% markup because of the relatively high dollar volume. In all cases, it’s your choice -- and one that you can make or change anytime, very easily. Staff members aren’t vendors, since they’re paid through payroll. Staff time is accounted for with time sheets, not A/P invoices. Just what is a freelancer? A freelancer can be both a staff member and a vendor. If you’ll track a freelancer’s time on an hourly basis with Time Cards or Time Sheets, then he or she is added as a staff member. But if the freelancer is also added as a vendor, then he or she should be added twice -- once as a vendor then again as a staff member. The staff member’s initials must be different from the vendor number. If a staff member has the same code as a vendor, costs will appear duplicated on job cost reports -- but it’s just a cosmetic problem. To prevent this problem, give the freelancer slightly different vendor and staff codes. What are temps? A temp acquired from a temporary placement agency is not a vendor; instead, he or she is a staff member. So who is the vendor? The placement agency is the vendor, since they’ll be sending you bills for the temp’s hours worked. To find a vendor, choose File > Find Vendor, enter the vendor number, then click the Find button. You can also find vendors by sequence (i.e., the order that they were added into Clients & Profits X) or by company name using the Find Vendor By pop-up menu. To browse through the staff database, click the Next and Previous toolbar buttons. 1 Click the add button or choose Edit > Add New Vendor. 2 Enter the new vendor’s number, name, address and other details then click Save. New vendors are not automatically numbered. Any kind of 10-character number or code can be used. 1 Click the edit button, or choose Edit > Edit Vendor. Anything about a vendor -- except its number, account balance, and purchase history -- can be changed at anytime. Vendors without any activity can be deleted at anytime. A vendor with an outstanding balance can’t be deleted; if so, the vendor’s unpaid invoices wouldn’t have an account to update. A vendor with no balances, but paid invoices, can’t be deleted either. If so, the vendor’s invoices -- although paid -- wouldn’t know to which account they belong (and probably neither would any user). So for better accountability, only vendors without activity can be deleted. 1 Choose Edit > Delete. A vendor with invoices or POs can’t be deleted. Instead, an old vendor can be made inactive by choosing Edit > Edit Vendor then unchecking the Active checkbox. Inactive vendors don’t appear on lookup lists or vendor reports and can’t be used for new purchase orders or A/P invoices. Inactive vendors can be used again by simply checking the Active checkbox. The vendor’s notes describe something about a vendor. These notes don’t usually appear on standard C&P reports, but can be used on custom reports. 1 Click the Notes link. 2 Enter the vendor’s notes then click Save. The names and phone numbers are tracked for each vendor using the Vendor Contacts window. They’re completely customizable, as well as optional. 1 Click the Contacts link. 2 Enter the vendor’s contact names and phone numbers, then click Save. 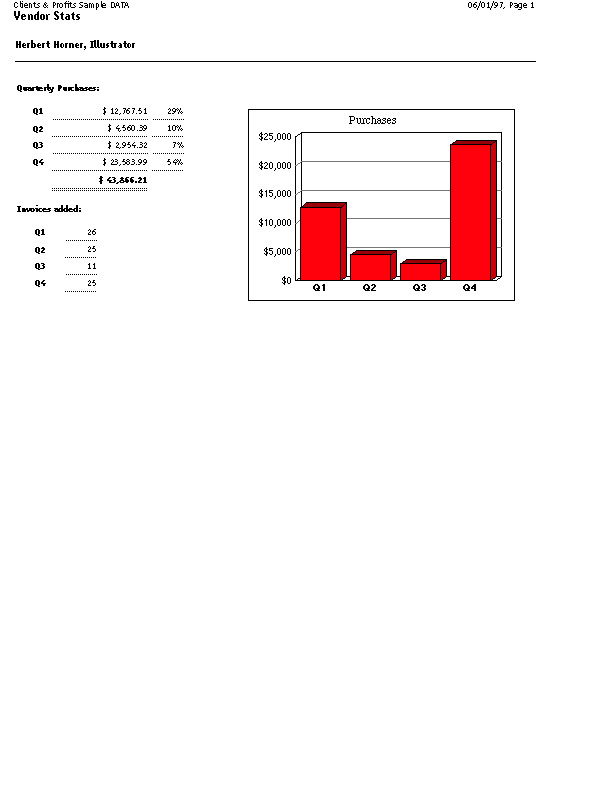 The Vendor Statistics window displays the total purchases (including the number of invoices) for each quarter of the current year. To see last year’s totals, choose Last Year from the Show pop-up menu. Clicking the Graph button calculates the quarterly totals and draws a graph. Clicking the Print button prints a hard-copy version of the stats window. 1 Find a vendor, then click on the Stats button. 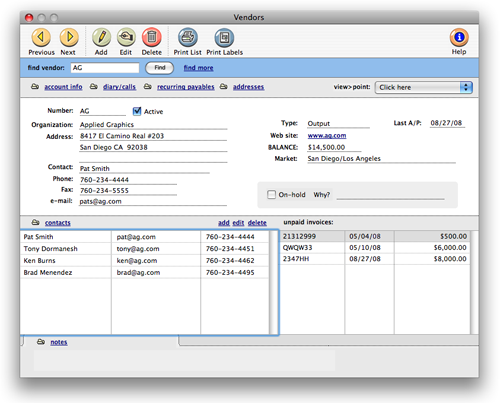 The account ledger shows a detailed listing of the vendor’s invoices. The report shows at a glance just what you’ve purchased from a vendor. It can be a helpful report, giving you valuable financial data that you can use when negotiating better prices. 1 From the view>point menu, choose View Account Ledger. 1 Click the Acct Info link, make your changes, then click Save. Is there a way to do a mass delete of inactive vendors that have had their po’s and invoices purged? There is no option to mass delete vendors from your Clients & Profits database. Vendors should be deleted one at a time.